Middle Eastern cooking for World studies Kids cooking activities. 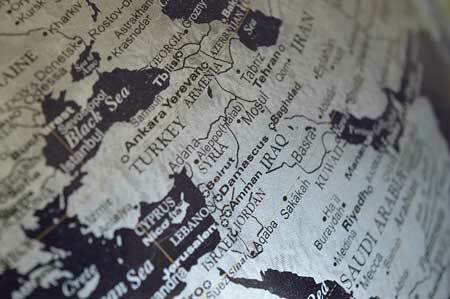 Middle Eastern Cooking covers many countries including Algeria, Bahrain, Egypt, Iraq, Iran, Israel, Jordan, Kuwait, Lebanon, Libya, Morocco, Oman, Palestine, Qatar, Saudi Arabia, Syria, Tunisia, Turkey, United Arab Emirates, and Yemen. Some common Middle Eastern cooking ingredients include pita bread, lamb, eggplant, cumin and cayenne pepper. Preheat oven to 400. Pierce eggplant in several places with a fork. Place on cookie sheet lined with tin foil. Bake for 1 hour. Eggplant will be soft and flat. Allow to cool then scoop out flesh into a blender. Discard skin. In skillet, heat oil and sauté onions and garlic. Cook and stir 3 minutes or until onions are transparent. Add to blender and add lemon juice and peanut butter. Blend until smooth. Stir in parsley and pepper. Serve with toasted pita wedges, cooked chicken or cut vegetables. Have child open beans with can opener and drain liquid out. Place beans in a bowl and mash with a potato masher or have adult use the food processor. Stir in garlic clove, salt, cold water, lemon juice and tahini paste. Eat with pita bread. Rinse and dry lettuce and parsley. Wrap parsley in a lettuce leave and chop lettuce and parsley in very small pieces. Set aside. Soak ½ Cup bulgur wheat in boiling water for about 30 minutes. Water will be completely absorbed by wheat. 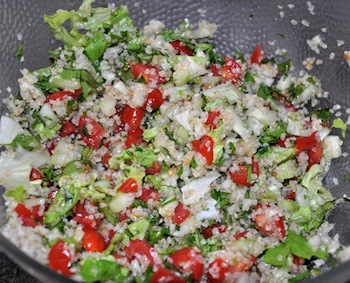 Add finely diced tomato, onion and cucumber to bulgur after done soaking. Stir in lettuce. Pour lemon juice and vegetable oil over mixture and toss to coat. Season with salt and pepper and serve this Middle Eastern cooking recipe immediately. **The key to this recipe is to chop vegetables finely. 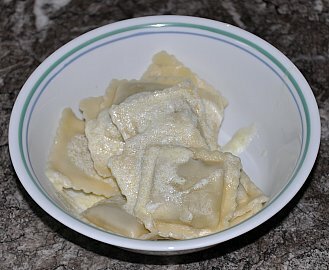 Manti is a Turkish dish. This Middle eastern cooking recipe is very popular. 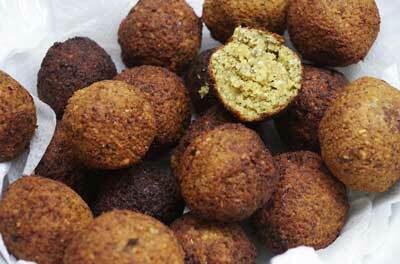 It is fried balls or patties made from chick peas. Wash chick peas and soak overnight in a large bowl. 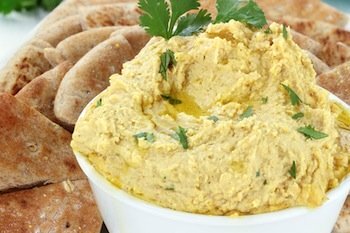 Drain chickpeas and add to a blender or food processor. Add chopped or grated onion and parsley. Blend together then add baking soda, salt, cumin and pepper. Blend together again. Add ½ cup water and 1/2 cup flour to make a smooth paste. If mixture is still sticky add an additional tablespoon of flour and use wet hands to form into patties or balls. Or drop spoonfuls of dough into hot oil. Fry patties until browned on both sides. 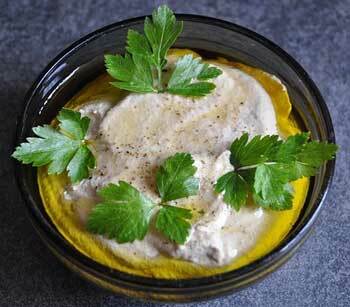 Serve warm with tomato slices and tahini sauce. Mix all ingredients together making a smooth sauce. Set aside. Boil rice in 8 cups chicken broth on low heat until rice is done. Whip flour, yogurt and eggs together until smooth. Add into the boiling chicken broth. Stir until well blended. Melt butter in saucepan and add mint. Sauté for one minute and stir mint into soup. * Mint is used in many dishes in Middle Eastern cooking. In this dish it is especially essential with the yogurt. A Middle eastern cooking recipe that is often served with bread for breakfast. Prepare this one day before using. In bowl stir yogurt and salt together. Place on top of a large piece of cheesecloth. Tie up ends together and hang in the fridge for 12-24 hours. Place a bowl under the cheesecloth to catch drips. 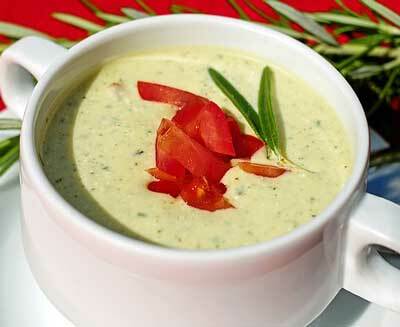 The next day you should have a creamy sauce like sour cream or cream cheese. Add ingredients together (except olive oil) in a large bowl. Knead ingredients together with your hands several minutes. Shape into balls and grill or bake in olive oil. These are served in pita bread with tomatoes, cucumbers and hummus. 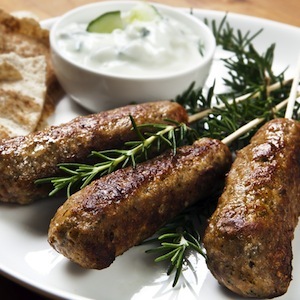 You may substitute ground pork or ground beef for the lamb.